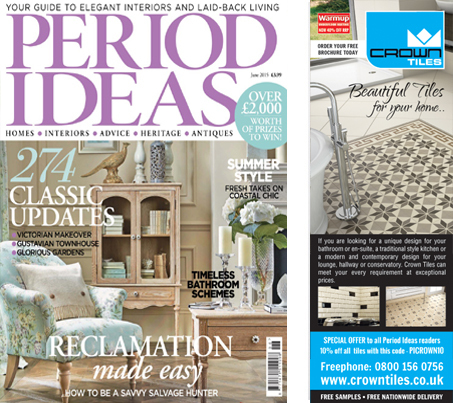 With 180 pages of advice and inspiration, Period Ideas is the biggest traditional homes magazine on the market. Covering everything from the bricks-and-mortar of renovation to the most beautiful interiors. You’ll find every issue full of practical wisdom and design suggestions from some of the UK’s leading experts. So if you are after restoration advice and help for the period home, make Period Ideas your regular magazine. The tiles we have featured in this months advertisement from top to bottom are Sisal Snow, 20x10cm Metro Cream and Salone Beige.